Language as a Fashion Accessory? More and more nowadays people are stressing the importance of learning languages in order to benefit us socially and within business, to strengthen our country’s position within the global economy and to break down the communication barriers worldwide. 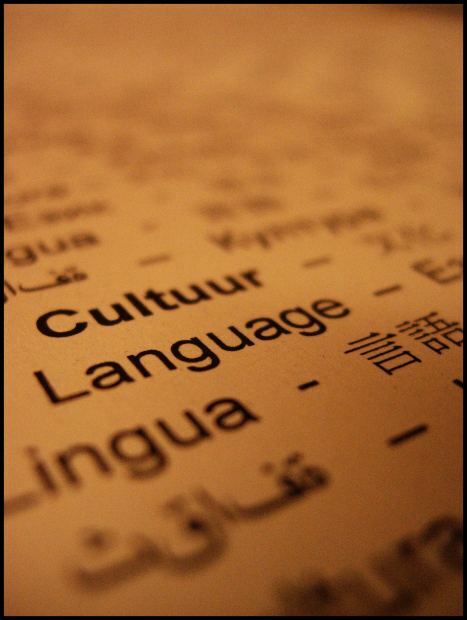 Aside from jobs within the banking industry dealing with international clients or linguistic careers, such as translators, what other careers can realistically benefit from a knowledge of languages? Sports personalities are increasingly stepping up to extol the virtues of having more than one language under their belt. Sporting events involve travelling to other countries so what better way to fully understand what’s happening around you in your working environment than by studying the relevant languages? Another, more glamorous, career can await you in the field of fashion if you choose to study another language. Lately, the fashion industry has been hyping up the benefits of learning foreign languages in order to further your career within the industry. English is still the lingua franca of the fashion world so is learning other languages merely a fad? Are foreign languages a new fashion statement deemed necessary at the time but one that will soon change just as the styles change over the seasons? Although English is widely spoken amongst the fashion community, it is deemed more ‘polite’ to speak the language of the people you are dealing with. The British Fashion Council has advocated the benefits of learning foreign languages as a way to promote UK based brands and designers worldwide. By focusing on languages, they believe that Britain’s standing within the fashion world will increase. Overseas supply chains mean that intra-company communication is vital whether it entails sales, stock, marketing or accounting. Take the company New Look, for example. The UK’s favourite high street shop is currently looking to expand its position within the European market as well as broaching the subject of launching in China. Speaking to collaborators in English alone will eventually get the job done, but speaking in the languages of the host countries will ensure a much quicker and more fluid transition. Conversely, the high street shops of H&M and Zara originate from abroad but are the second and third favourites for the UK. Designers, PR representatives and administrators have stated that having a knowledge of foreign languages has given them flexibility within the fashion industry, making their jobs easier and themselves more adaptable to requirements. Many international brands actually look for language skills when they are recruiting and offer training to staff who are not fluent in the particular language required. The fashion industry goes hand-in-hand with the media so being able to converse with photographers, journalists, editors, events’ hosts, designers and outlet owners is essential. Building relationships in any aspect of the fashion world is vital if you want to forward your career. As with all careers, working in fashion is competitive, so for those who want the edge over their competitors then learning foreign languages will ensure they stand out and have increased accessibility to opportunities. So a foreign language is a fashion accessory you can’t do without! Get ahead with the latest language trends to make sure you stand out from the crowd! The Spanish are known for their love of partying with fiestas, festivals and celebrations for pretty much every occasion. You can’t miss out on these spectacles when you’re travelling through Spain if you really want to get a feel of how the Spanish live. Whether you go to local events or the big national ones, you can fully immerse yourself into the atmosphere. While you’re there, learn the names for the events and phrases associated with them. Semana Santa is Holy Week celebrated at Easter and transforms each area with huge processions. Whilst somewhat intimidating when seen for the first time, this is a spectacle you won’t want to miss! The processions are led by the religious brotherhoods, also known as penitentes (penitent ones) dressed in robes, capes and cone shaped head gear. They may look sinister but their outfits have religious meaning as does every aspect of the ritual including massive floats carried by the participants. Join the crowds of onlookers for this spectacular scene! Be prepared to get messy in this bizarre festival! A massive food fight takes place in the town of Bunol, Valencia, every year. Thousands of people flock to the town in order to take part in the event. A week of festivities includes a paella cooking contest, fireworks, music, dancing and parades. 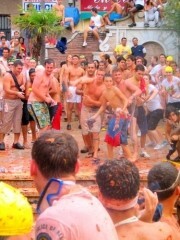 A greased wooden pole of two storeys high is topped with a ham and contestants try to reach the prize before the tomato fight begins. Invariably, the prized ham is never reached so the water cannons herald the start of the ensuing chaos! Large over ripe tomatoes are hurled everywhere and at everyone for an hour until the whole town is drenched in tomato pulp! The Carnival in Spain is a raucous event of partying which includes drinking, dancing, beauty pageants, contests and masquerading from dusk until dawn. The wild event is held all over Spain but the most extravagant one takes place each year in Tenerife which runs a close second to the one in Rio de Janeiro. It is the biggest of the Carnival festivals in Europe and the main event is the crowning of the Queen of the Carnival chosen from girls parading in their flamboyant costumes. Make you make time during your travels to take part in the masquerades and dancing! Have fun with the locals during your Spanish trip and practise your language skills while you’re partying! Take a refresher course before you leave to get the most out of your holiday. What festivals, fiestas and celebrations have you seen in Spain and which ones can you recommend to other travellers? Foreign Language Learning in the UK is on the Up-and-Up! The UK may currently be behind the rest of Europe with our knowledge of foreign languages, but not for much longer! Getting ready to put our bad reputation for languages, or lack of, behind us, primary school children throughout England will soon be learning foreign languages. It will be compulsory for children over 7 years old to learn another language. Schools throughout England are also being encouraged to offer more languages to their pupils. That’s the younger generation taken care of, but what about the rest of us? Well, we’ve taken matters into our own hands as the learning revolution is in full swing. And with adult education being so easily accessible, then why not. We can learn anything we want to with subjects ranging from standard academic ones to business requirements to specialized fields to fun courses. The levels range from beginners’ courses to high level qualifications, with certifications including diplomas and degrees. It goes without saying that this learning revolution includes languages with the option to learn almost any language you can think of. The traditional way to learn a new language is to attend classes in an educational institution. Whilst this is ideal for some, it’s not convenient for many of us. Many are put off of learning by associating it with the traditional ways, preferring informal classes with a few friends in a more relaxed setting. Many lessons can be taken at home or at the workplace, and tutors are happy to conduct intensive one-to-one classes or group sessions. Having the ability to speak other languages broadens people’s horizons, not just socially but within business. It increases confidence and our awareness of other people and other cultures. Employment opportunities are soaring for those who can speak another language, resulting in businesses providing employees with help and incentives towards improving their language skills, including support with language tuition. More and more people are in a position to travel with increasing numbers making the decision to live abroad. By learning the language of the relative country, even if just at a basic level, a huge difference will be made to the experience had there. With the learning trend set to continue and with language courses on the increase, the UK will soon be giving our European comrades a run for their money in the linguistic stakes. What has motivated you to want to learn a new language? Do you prefer the idea of one-to-one lessons or would you be happier to learn within a group? Join in with the learning revolution and start your new language lessons! You are currently browsing the Language Museum weblog archives for January, 2014.